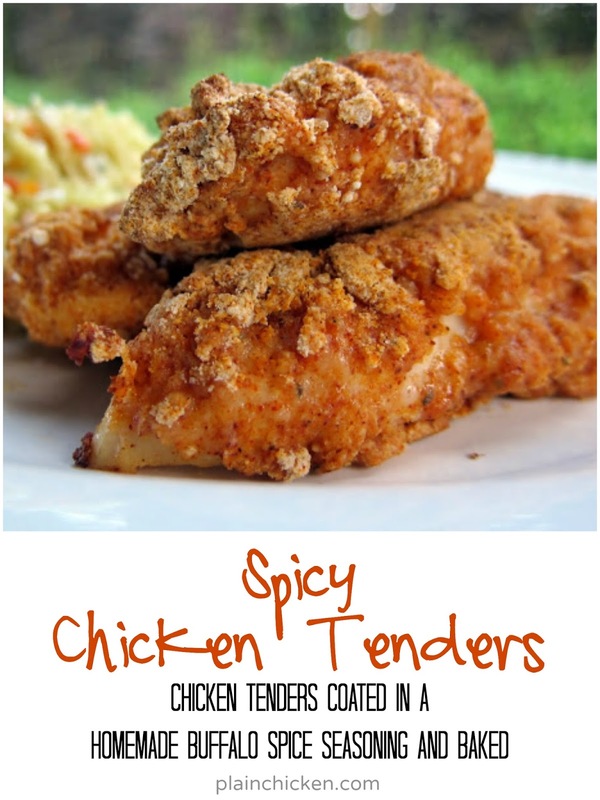 Chicken Fingers are one of my favorite weeknight meals because they are quick and easy to make. I adapted this recipe from the Bisquick website. We already love their Ultimate Chicken Fingers recipe, so we were anxious to give this recipe a try. The chicken fingers were fantastic! One of our favorites. We both really loved the spice blend on the chicken fingers. It reminded us of a buffalo chicken wing, but much easier to eat! Heat oven to 450°F. Line cookie sheet with parchment paper or foil. Dip the chicken breast tenders into the egg mixture, then into the Bisquick mixture, then back into the egg mixture and finally back into the Bisquick mixture. Place on cookie sheet. Repeat with remaining chicken. Spray chicken with cooking spray. That looks like a very good spice blend. I'm not sure about mixing some of the milk egg mixture into the Bisquick mixture. I'd rather have a smoother coating on my pieces. But, one thing I do instead of milk & eggs is to dip the chicken pieces into a flavored marinade before dipping into the flour mixture. I've used Lemon Pepper marinade or Balsamic dressing, but you could use Jamaican Jerk marinade or a cajun marinade with this. It adds flavor and helps the breading stick to the chicken. SJerZGirl - I wasn't sure about the egg mixture in the dry ingredients either, but it turned out great. It helped the coating stay on better - kind of like double coating the chicken. These sound so good. Love that they have kick in them too. I just finished eating this! The double dip makes for a lovely coating, not too much and not too little. I'd also add a lot more spice, but that's just for my taste!! Lovely recipe, thanks for tea!! I've only just discovered that I like red pepper in things like southwestern grilled chicken so I'll have to try this with my chicken nuggets.